In this SlOkam, ALavandhAr enjoys pirAtti’s (SrI mahAlakshmi) infinite enjoyability and exclusive existence for emperumAn as said in thiruvAimozhi 10.10.6 “unakkERkum kOla malarp pAvai” (SrI mahAlakshmi, who resides in the beautiful lotus flower and who is a perfect match for you). thava SriyA – being your wealth. Even when enjoyed always In your universal form, pirAtti amazes you with her qualities, beautiful form and nice activities and appear like new in all [of your] states (of bhagavAn such as param (in paramapadham), vyUham (kshIrAbdhi – milk ocean), vibhavam (incarnations) and so on), being a match for you exclusively and being your wealth. svavaiSvarUpENa sadhAnubhUthayA’api – Your highness who is omnipotent, cannot comprehend her enjoyability even when you enjoy her with all your forms, at all times and in all ways. Even if you assume many forms like saubhari [a sage who assumed 50 forms to marry 50 girls] at once, you cannot comprehend that. Even if the states are many, it is impossible to comprehend as said in SrI rAmAyaNam sundhara kANdam 38.21 “paryAyENa prasupthaScha” (sIthA says to hanuman – I slept on SrI rAma’s lap for a long time and he too slept in my arms for a long time). 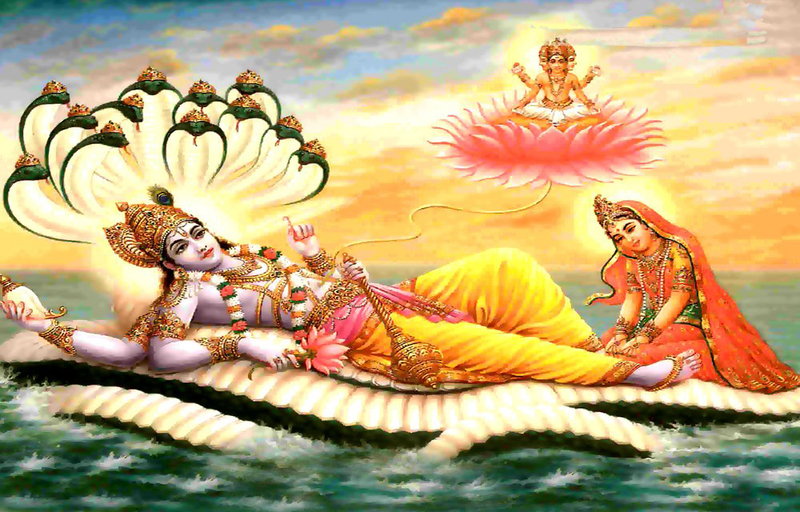 apUrvavath vismayamAdhadhAnayA – The enjoyment is so fresh every day that it will be so amazing. Whatever the nithyasUris feel/enjoy towards bhagavAn as said in chAndhOgya upanishath 7.26.2 “sa EkadhA bhavathi | dhvidhA bhavathi |” (the liberated soul assumes one form, two forms, many forms and enjoy bhagavAn), he feels/enjoys that in the case of pirAtti. pirAtti’s enjoyability is such that you feel/enjoy in her case, whatever is felt/enjoyed in your case by AzhwArs as said in periya thirumozhi 8.1.9 “paNdivaraik kaNdaRivadhu evvUril yAm” (where did we see him before? ), thiruvAimozhi 2.6.6 “appozhudhaikkappozhudhu en ArAvamudham” (every moment, he is my ever-fresh nectar), by nithyasUris as said in “sadhA paSyanthi” (always seeing). How does she give you pleasure? guNEna rUpENa vilAsa chEshtithai: – By her physical beauty and qualities such as Seelam. As said in SlOkam 56 “sakruth thvadhAkAra vilOkanASayA” (desiring to see your divine form just once), with the qualities as said in thiruvAimozhi 8.1.8 “IrginRa guNangaLaiyudaiyAy” (you who is having qualities that pierce me) and the activities as said in thiruvAimozhi 5.10.2 “un seygai naivikkum” (your activities weaken me), great personalities (AzhwArs) become fully immersed in him. Such emperumAn becomes immersed in pirAtti. bhagavAn‘s svarUpam (true nature) is incomprehensible; pirAtti’s enjoyability is incomprehensible. sadhA thavaiva uchithayA – She is a perfect match for your highness as said in SrI rAmAyaNam sundhara kANdam 16.5 “thulya Seela vayO vruththAm” (SithA and SrI rAma are perfect match in qualities, age, activities etc) and in thiruvAimozhi 10.10.6 “unakkERkum kOla malarp pAvai” (SrI mahAlakshmi, who resides in the beautiful lotus flower and who is a perfect match for you). sadhA – In all states such as param, vyUham, vibhavam etc (See parathvAdhi panchakam at http://ponnadi.blogspot.in/2012/10/archavathara-anubhavam-parathvadhi.html ). It can also be said as “guNEna rUpENa vilAsa chEshtithais sadhA thavaivOchithayA” (always a perfect match in qualities, form and activities). thava SriyA – As said in SrIvishNu purANam 1.8.17 “vishNO: SrI:” (belonging to vishNu) and in thiruvAimozhi 10.10.2 “un thiru” (your lakshmi, your wealth), she is existing exclusively for you and is the wealth for your highness. This entry was posted in Other, sthOthra rathnam on January 20, 2017 by Sarathy Thothathri.